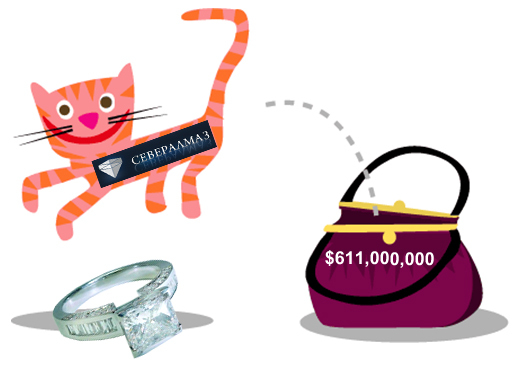 ALROSA LETS $611 MILLION CAT OUT OF THE BAG – WILL RIO TINTO FOOT THE BILL? When it comes to transparency of corporate practice and accountability for the spending of state money, Alrosa, the Russian state diamond monopoly, isn’t famous. But one thing is finally clear – Finance Minister Alexei Kudrin has at long last gotten his wish to be relieved from having to serve as chairman of the board of directors (aka Supervisory Board) of the company. By the presidential order of April 2, Kudrin has been ordered to vacate the chairmanship of Alrosa by July 1. Kudrin’s interest in the diamond concession hasn’t been the largest of his interests — Russian diamonds, after all, are worth little more than $3 billion a year, a minuscule fraction of the state’s finances which Kudrin is duty bound to supervise each day. Even if Alrosa is valued at $12 billion, the maximum its chief executive, Fyodor Andreyev has recently publicized, the company is small beer to the Russian treasury. If the amount of trouble with Yakutia is measured against the value of the company, the rub to reward ratio may be relatively high – and that’s been another reason Kudrin has wanted to escape from responsibility. He has been uncomfortable negotiating with the presidents of the Sakha republic – Mikhail Nikolaev was tough, Vyacheslav Shtirov even tougher. Better to say, subservience to his superiors is Kudrin’s strong suit, not toughness with his peers. President Dmitry Medvedev has accordingly granted him his exit wish, albeit not for nothing in return. 5)The cost of the additional shares in OAO Severalmaz: up to 17,100,000,000 (Seventeen billion one hundred million) rubles (at the price of 1 ruble per share). Severalmaz (“Northern Diamond”) was privatized in the 1992 and its shares sold off in a fashion that made those involved moderately rich for that time. Then De Beers bought control of the company for about $25 million, only to abandon the property and the prospect of mining Severalmaz’s principal asset, the Lomonosov diamond field in Arkhangelsk region. De Beers sold to Alrosa because it had calculated that the forecast profitability of the proposed mine wasn’t great enough to compensate for the diamond value it planned to extract, the difficult mining conditions, the uncertain licensing, and other problems that aren’t publishable in a place young children might see. Severalmaz says on the company website that its current share issue amounts to 389,457,070 shares, with a par value of one rouble, making the equivalent in value of $14 million. Alrosa owns a trifle more than 95%; a class reported as “nominal shareholders” holds 4.4%; while another class of “minority shareholders” holds the remainder of about 0.6%. What Kudrin and the Alrosa shareholders have decided is to issue almost 44 new shares of Severalmaz for each old one on issue, and to pay cash of Rb17.1 billion, or $611 million. This is a big sum — for a company with net income in 2010 of Rb8.8 billion ($293 million), the Severalmaz share issue looks like costing Alrosa double last year’s profit. Last October, when Alrosa issued a 10-year $1 billion Eurobond, it omitted to mention that it planned to pay $611 million for new shares of Severalmaz. Severalmaz, in fact, was scarcely mentioned at all, and did not rate among Alrosa’s declared new mine priorities. In the last audited financial report Alrosa has issued – for the 9-month period of 2010 – there is no reference to Severalmaz at all. But wait — perhaps the wording of the announcement has been misread. Perhaps this sentence – “the payment method for the additional shares in OAO Severalmaz is by money, in Russian Rubles” – doesn’t mean that Alrosa intends to buy the shares at all. What if Alrosa has decided to issue the new shares, but then sell them, or at least half of them, to someone else? Far be it from the affairs of a state company, whose loan and bond debt is held by international institutions and whose shares will be offered sometime soon to public shareholders, to be so clear that a $611 million outlay should be explained. When Andreyev was asked by telephone for the explanation of this transaction, his spokesman, Andrei Polyakov, refused to answer. So he was sent this email – is the sale of Severalmaz shares part of the proposed deal between Alrosa and Rio Tinto, for the latter to take over operating responsibility for building the Lomonosov mine? It is an open secret that Rio Tinto has been negotiating with Alrosa for a mining deal at Lomonosov. In December, Alrosa arranged for a media leak to report the terms it was offering: Rio Tinto was to receive a stake of 50% less one share in Severalmaz in exchange for $250 million cash down, plus the investment obligation of $135 million to bring output of the mine to 2 million carats per annum by the year 2015. Rio Tinto hasn’t denied the negotiations, but hasn’t agreed on the terms either. At least not yet, and not publicly. If the two sides have advanced further than they were four months ago, then Alrosa’s shareholders have just done what the Lomonosov term sheet presumably requires – prepare for the sale of 50% less one share in Severalmaz for a price of $313 million (counting the old shares on issue as well as the new ones). That may be the down-payment required of Rio Tinto – in which case the international miner has agreed to pay more than the price published in December. Or else, it represents the cash payment and the investment requirement; in which case, the deal will cost Rio Tinto roughly $72 million less. Since the seller in this deal has announced the mystery $611 million, and refuses officially to explain it, Andreyev’s spokesman was asked whether the issue of new Severalmaz shares is part of the Rio Tinto-Alrosa transaction, and to confirm this by not responding. He has not responded.